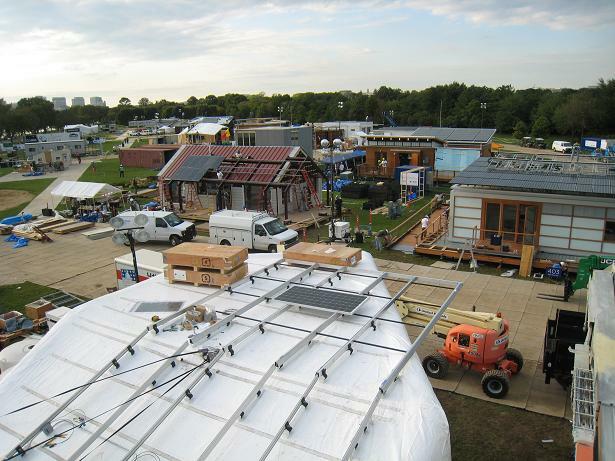 Under mostly cloudy skies and occasional light rain, U.S. Department of Energy Solar Decathlon teams continue assembling their houses around the clock to finish the assembly phase of the competition, which for most (and hopefully all) teams will end Tuesday. Today, I attended a party that New Zealand (Victoria University of Wellington) held for a team member’s birthday and to say goodbye to their Canadian friends who came from Ontario to help them. 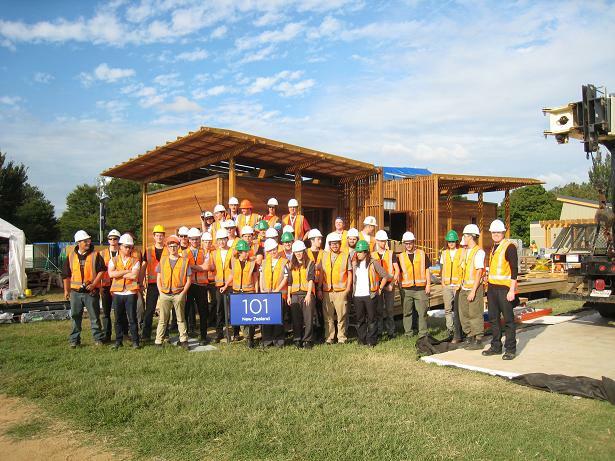 The Canadians—from Fanshawe College—are contemplating applying for Solar Decathlon 2013, so the New Zealand team suggested they join them as team crew. Fanshawe sent a few staff and students for assembly and disassembly, and some of them will stay in Washington for the entire event. Team Massachusetts (Massachusetts College of Art and Design and the University of Massachusetts at Lowell) arrived on Thursday three days late but assembled its main structure in only six hours. Team New Jersey (Rutgers – The State University of New Jersey and New Jersey Institute of Technology) finished installing its solar array today. Maryland was the first team to qualify for electricity meter installation (which happened yesterday) and as of this morning led the other teams in the number of inspections passed. In addition, the Southern California Institute of Architecture and California Institute of Technology took my camera up in their cherry picker for some way-cool aerial views of the village. Tomorrow will be more assembly—which will include the installation of lots of village infrastructure (tents, signage, and portable walkways for visitors)—and, no doubt, more firsts and finishes by this stellar group of teams. This entry was posted on Saturday, September 17th, 2011 at 9:31 pm and is filed under Maryland, New Zealand, SCI-Arc/Caltech, Solar Decathlon, Solar Decathlon 2011, Team Massachusetts, Team New Jersey, Teams.